The visit to the Lenin Mausoleum, in which the mummified body of Lenin is still preserved, has become one of Moscow’s main attractions. 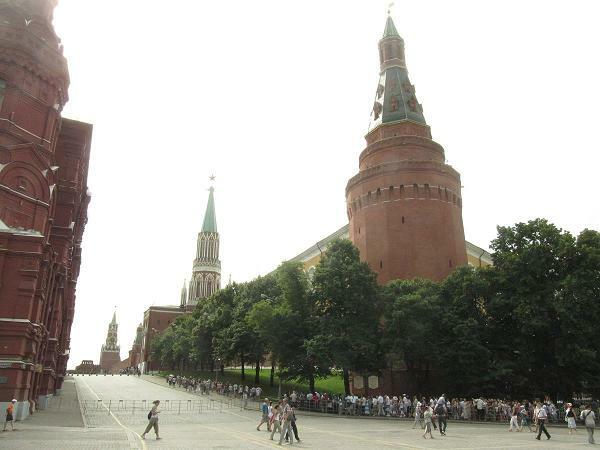 The Mausoleum is located in the Red Square and the visit is free. All you have to do is wait in line, which can be longer or shorter depending on the time of year. 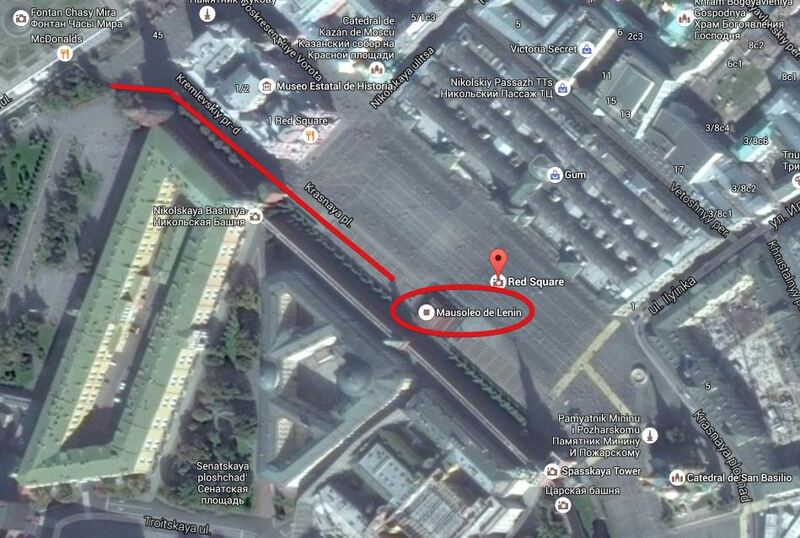 What is the Lenin Mausoleum? Lenin’s Mausoleum is a Soviet monument, by the architect Aleksei Schusev, in which the mummified remains of Vladimir Ilyich Ulyanov, better known as Lenin, the main leader of the October Revolution in 1917 and the first Soviet President, are preserved. 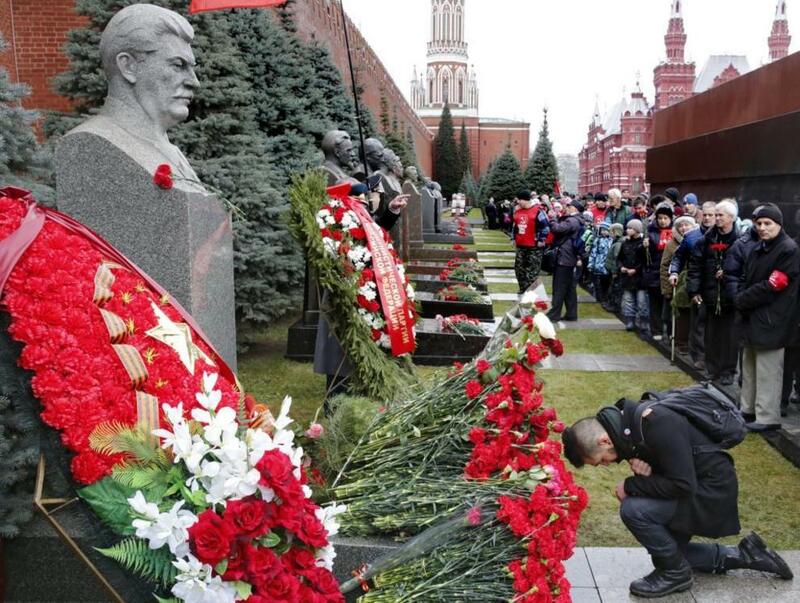 Lenin died in 1924 (at 53 years of age), but even though he had expressed his wish to be buried in St. Petersburg with his mother, Stalin was the one who made the decision to embalm his body. For this purpose, a scientific committee called the “Commission for Immortalization” was formed to find a magic formula that would preserve the body in time. 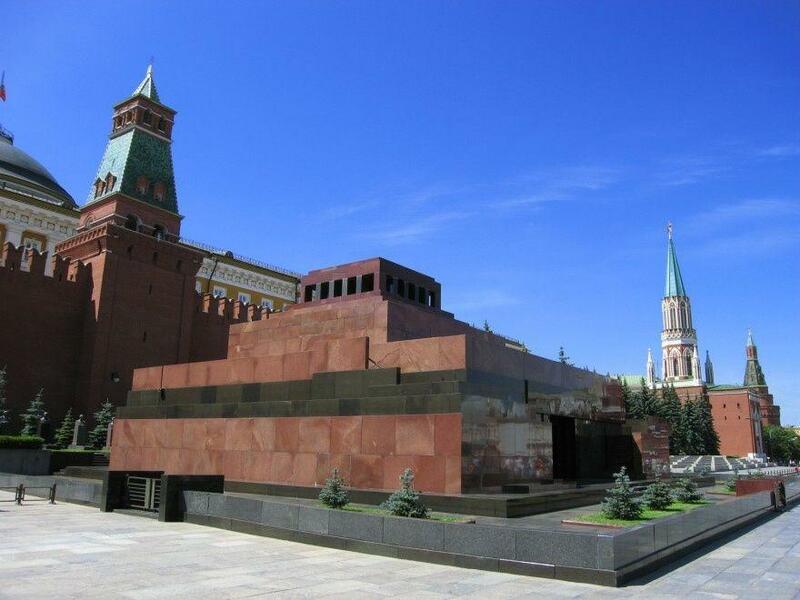 With some exceptions (for example, during World War II, in which the remains were moved transferred to Siberia), the body has remained in the Mausoleum on Red Square since 1924, becoming one of Moscow’s main attractions, both for locals who want to pay him homage, to those tourists who are curious to see the mummy of the Bolshevik leader. In the mausoleum itself there is a laboratory with biologists, biochemists and anatomists. Each year, over two months, the body is treated with a special solution, they also change his suit and the damages the body may have suffered are repaired. The body is protected by a glass bulletproof sarcophagus. 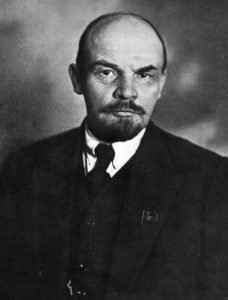 It is said that with so many chemical treatments, the body of Lenin looks more and more like a mannequin, at least that’s the impression I have from the times I’ve visited. The visit is free. No need to purchase any tickets. To make the visit you just have to get in line (the red line on the map above) and depending on the day and time of year it can be more or less long (see photo below), though I must say they usually move quickly. The times I’ve made this visit I have waited around 30-45 minutes. There are also unofficial guides offered to tourists through which you can avoid the line but paying a price. The Mausoleum is open every Tuesday, Wednesday, Thursday and Saturday, from 10:00 to 13:00 hours, as long as it is not festive, there is no official act and it doesn’t coincide any body treatment period or monument restoration. On the way to Lenin’s Mausoleum, before entering, you pass in front of the Necropolis of the Kremlin Wall in which there are buried other military or former Soviet presidents, such as Stalin (whose body also remained embalmed next to Lenin’s in the Mausoleum since his death in 1953-1961), Chernenko, Brezhnev and Yuri Andropov. In the Necropolis of the Kremlin Wall there are also buried some Russian celebrities, such as astronaut Yuri Gagarin. Inside the mausoleum you can’t take pictures. You can’t enter with any type of hat or sunglasses, since it is considered disrespectful. Inside the mausoleum the atmosphere is cool because of the air conditioning and it takes just a few minutes to get in and out. You can’t stop to look inside the body. 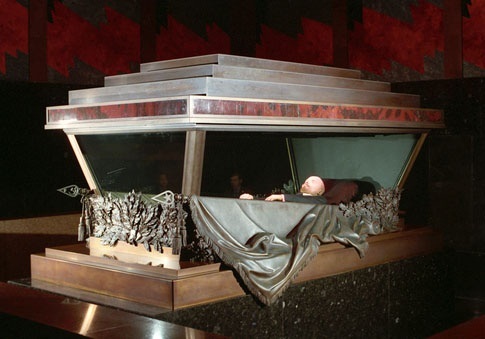 After the disintegration of the Soviet Union in 1991, political parties and personalities (such as Mikhail Gorbachev) have called for the dismantling of the mausoleum so that the remains of the leader are buried. Also, an increasing part of the population (some surveys report a 56%), ask for Lenin to be buried so he finally rest in peace. However, these initiatives have not been supported by the Russian government and the mausoleum remains open to the public. 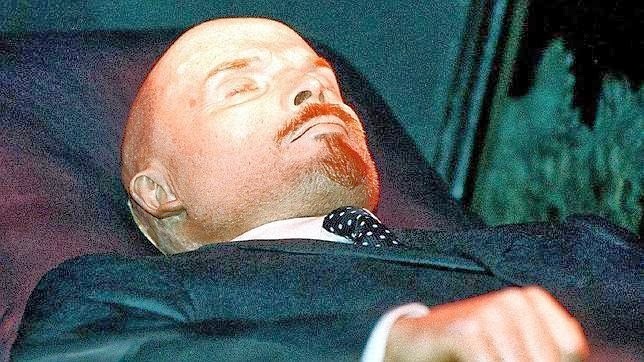 President Putin has said on occasion that Lenin will remain in the Mausoleum until a clear majority of Russians are against it. In 2024, it is the centenary of the Mausoleum. Will it be time to bury him next to his mother in St. Petersburg as his will stated?